Meet Missie at Homeward Pet in Woodinville. Photo courtesy of Homeward Pet. With input from our friends at Homeward Pet we are featuring a dog that needs a loving home. Please be aware that our pets of the week may be adopted at any time and we are not informed when this happens. Bouncy and flouncy. Spunky and jumpy. And as cute as can be! 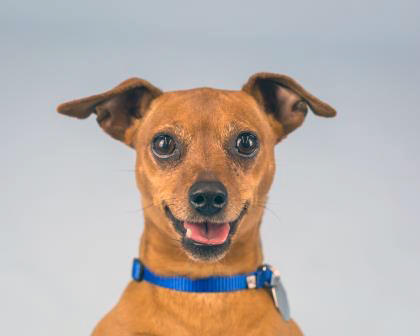 Missie is an eight year old Miniature Pinscher mix ready to brighten up your life. She’ll be your sunshine on even the cloudiest of days. She finds great joy in playing with toys, going for walks, and of course cuddling in her person’s lap. You’ll instantly catch the love bug when you meet her. Missie lived with other dogs and cats before and may enjoy having other furry friends at home to keep her company. Any kids in the home should be old enough to handle her gently. Come meet Missie today!